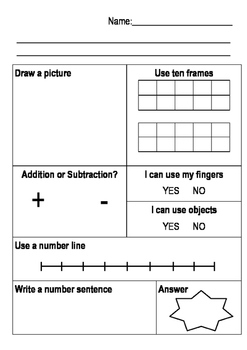 I created this template for my students to use when looking at word based maths problems. I found it very useful in supporting K-2 students to understand and solve addition and subtraction problems. Can be used as a whole class guided lesson or a independent activity. I write the problem at the top of the page and support students to use the different strategies to solve. The strategies include drawing a picture, using ten frames, using fingers, objects and a number line to represent. Finally students write the number sentence and then the answer. Great for sending home to parents, so they can observe their child's understanding of word based problems.